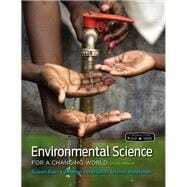 Following real people and real science, Environmental Science for a Changing World uses an engaging, journalistic approach to show students how science works and how to think critically about environmental issues. Each module uses a single, integrated story to provide context for the science with beautifully designed infographics to clarify essential processes and concepts. This approach has proven so effective that instructors using the book report a dramatic increase in the number of students who read the assignments and come to class ready to participate. The third edition features new stories, updated scientific coverage, and a new modular organization that makes using the book easier than ever. Each chapter is home to two or more modules that focus on different aspects of a topic, giving instructors flexibility to tailor reading and online assignments to their course. Every module tells a compelling, integrated story, and is built on a pedagogical framework of Guiding Questions to help students identify the scientific concepts that form the basis for the story. This edition also has a dedicated version of Macmillan’s online course space, SaplingPlus, home to the interactive eBook, all resources, and pre-built units for each module with ready-to-use assignments and activities for both traditional lecture and active classrooms.